I have outlined a select set of my projects from both graduate and undergraduate coursework below (in no specific order). Dede's Fall course on transformative emerging (learning) technologies provided the background theoretical knowledge for this project. 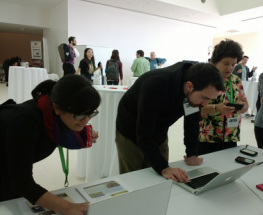 Images below are from the Newton field trip (left and center) and a project booth during a conference at the MIT Media Lab. REAL hotspots programmed using FreshAiR software that the students will discover during their EcoMOBILE field trip. and designs in the future. studio-based course on HCI, I also studied some theoretical principles of interaction and design. other learning theories like Constructionism, I analyzed the strengths, opportunities, and subsequent improvements in learning outcomes. *SMEFT stands for Self-Efficacy, Motivation, Engagement, Flow, and Tenacity. advised by Prof. Sumithra Devi at RVCE, Bangalore. fully functional tool. The graphics editor supported operations such as "Cut", "Copy", "Paste", formatting and editing of text, and all file operations. ability to think computationally (and mathematically) in later years as an adult. an important element in designing a prototype for my project. I drew inspiration from existing work such as SMALLab and WiiPaint Demonstration application.